When Ken Freeman arrived at his first teaching job in Cedar Rapids, Iowa, the school custodian handed him a broom and told him to trade his suit and tie for a jumpsuit. A lot has changed since 1963 when Freeman, the first African American teacher in that school, was mistaken for a janitor. But the Flossmoor resident said, in many ways, the same inclination to prejudge still exists. That’s why Freeman is spending his golden years opening the doors of understanding. The retired District 218 administrator, whose team helped turn graduation numbers around at the former Aspen Alternative High School (now Delta Learning Center) in Robbins, today mentors college students and encourages teachers to get to know the back stories and cultures of the kids sitting in their classrooms. He was recently invited to speak to teachers in Plainfield District 202 about teaching beyond race and reaching struggling learners. 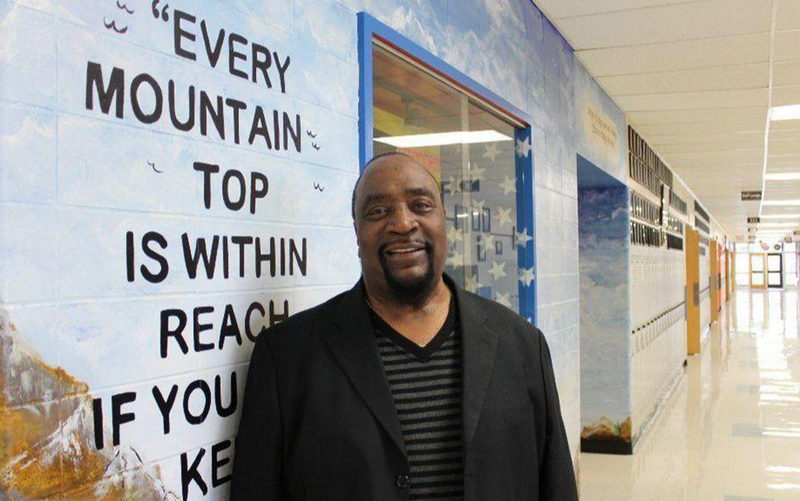 Freeman, former assistant principal of Elgin High School, helped pioneer the alternative program in Elgin, Ill., in 1987. When he moved to District 218 to become principal of Aspen, according to a 1995 Chicago Tribune article, the school was considered such a model that educators from District 230, Rich Township and all over the Midwest visited. “During the time I was there we really escalated to one of the top alternative schools in the country,” he said. The philosophy he helped steer then still rings true today, he said. “You should know something about every kid that comes through that door in the morning,” Freeman recently told teachers at Plainfield High School during a professional development workshop. “Not everyone is going to walk into your classroom looking the same. Don’t judge them by their appearance,” he said. Just because a kid looks different, he said, doesn’t mean he can’t succeed in school. As a result, he said, the district has a two-part mission: find teachers who look like the kids and help the teachers who are already there understand how kids of different cultural backgrounds think, feel and see the world. Freeman, whose son Kai Freeman is a middle school principal in Plainfield, Ill., “had a great message to deliver,” said Dan McDonnell, District 202’s director of high school curriculum. I was supposed to meet Freeman back in August. But the sudden death of his grandson delayed the interview by several weeks. Malik Freeman, a sophomore at Waubonsie Valley High School in Aurora, Ill., drowned Aug. 19 while on vacation at the Indiana Dunes. The family had been enjoying a last bit of summer before school was to begin, Freeman said. Malik, who would have turned 15 just weeks later, loved to play basketball and cook. He was one of three boys to lose his life in Lake Michigan that fateful August weekend. “Malik was a nice young man,” Freeman said, recalling how he, a former drivers ed teacher, had taken the teen to Waubonsie Valley Community College parking lot on a recent Sunday so he could practice driving. Freeman estimated 700 to 800 people came to Malik’s funeral. “He was just a freshman but he’d made such an impact on the school,” he said. A lot of teachers don’t take interest in the kids who struggle, Freeman said. “A lot of times teachers only taught the white kids who were going to college, the ones whose parents came to parent-teacher conferences,” he said. “Nowadays, if we’re true educators, we have to teach to everyone. He asked if the teacher had talked to the girl’s parents. She hadn’t. Freeman said though teachers don’t make house calls these days, understanding why a child is struggling can offer insight into how to help him. “You have to let kids know you’re interested in them. The way you do that is ask questions,” he said. In addition, he said, give kids who fall behind an opportunity to catch up. Freeman, who left teaching for a time to work for the Department of Labor, returned to education when he was offered an administrative job at Elgin High School. During his 11 years at Aspen, he said, graduation rates improved dramatically. “We were an alternative program, so we gave them alternatives,” he said. Evening and Saturday classes enabled struggling learners to catch up, while programs on drug abuse and social skills helped kids with behavioral issues, he said. A childcare center enabled young mothers to finish high school. Today, Freeman said, “We do a lot better trying to find out why kids don’t succeed. Freeman grew up in the Watertown projects of East Moline, Ill., attending a two-room all-black school until sixth grade. In high school, he said, he was never approached about taking college bound classes. “We (African American kids) just went to school, played sports and had our own social group,” he said. Even though Freeman didn’t play basketball, a coach from that sport took an interest in his potential and took him to visit Western Illinois University, where he ended up enrolling. Blacks, he said, were at the university primarily for sports. He played football and baseball. “They didn’t care about us academically, or as human beings,” he said. African Americans had their own Homecoming and relied on junior and senior students to guide them through class scheduling so they could meet graduation requirements. “I didn’t even know what an adviser was,” he said. “My dad was stabbed to death when I was in fourth grade. My mom raised five of us,” he said. “I told her when I was in sixth grade that I wanted to go to college. This woman saved $900 for me — a fortune back then. Today, he pays that sentiment forward by telling kids “there’s something good in all of us. Each one of us has something good we can offer society. But you have to believe in yourself and prepare yourself. “Whatever it is you want to be, do what you need to do to get there. Even if no one is pushing you. Push yourself,” he said. Self-reliance, he said, is important because even though much has changed in terms of battling racism, some things are still the same. One time, Freeman went to observe a DePaul University student working as a student-teacher. He arrived early to the North Side school and was standing in the parking lot waiting for the student-teacher when two women staffers pulled in, noticed him, pulled back out and parked at the other end, he said. Minutes later, he said, security came out and a Chicago police officer rolled by. Freeman said he presented his ID and explained why he was there. The security officer and the principal apologized and told him the two teachers, one white, one Hispanic, were alarmed to see a black man waiting in the parking lot.